Browse the article How does acne work? Four out of five people between the ages of twelve and twenty-five have acne, making it the most commonly diagnosed skin condition. In spite of its prevalence, there are a lot of misconceptions about how acne works and about how to treat it. See more getting beautiful skin pictures. Acne forms inside a person's pores. A pore is an opening in the skin through which a very fine hair grows. 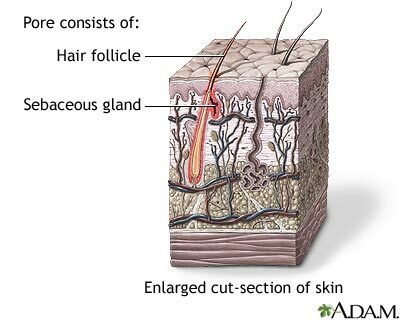 Sebaceous glands connected to the pores produce a substance called sebum, which lubricates the hair and the skin. Acne occurs when several things happen inside the pore. First, the sebaceous glands produce too much oil. Then, as the pore's lining naturally renews itself, it sheds dead cells. These cells -- not the cells on the surface of the skin -- combine with sebum to create a plug. The result is an enlarged, blocked pore called a comedo. If the plug stays beneath the surface of the skin, it causes a whitehead. If it reaches the surface of the skin, it causes a blackhead. If the walls of the pore break down, the result is a pimple, also called a pustule. Plugged pores create a perfect breeding ground for bacteria, which causes pain, inflammation and swelling. The bacteria and oil can also create deep, painful areas called cysts, which can lead to scarring. The National Library of Medicine has a collection of articles on acne and acne treatment.